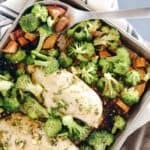 This one pan honey garlic chicken has everything you need in a single pan, including chicken, sweet potato, broccoli and a slew of tasty seasonings and sauce. Don’t you just love it when you can prepare your entire meal in one pan with minimal effort and clean up? It is the best! We love the ease and no-fuss of a one pan dish. We can’t take all the credit for this one though. We have adapted it from a recipe we found and loved on Damn Delicious. You can get the full recipe here, however, it is not Paleo. We switched it up a little with different vegetables and also ditched the refined sugar. All in all, this is one tasty and well-rounded meal surely to satisfy all of the mouths in your household, and here is a snapshot of how ours comes together. One of our favorite herbs that I think is often underutilized is oregano. People most often think of pizza or pasta when they think of oregano, but it can add a really great aromatic with a hint of sweet flavor to your dishes. It is warm and inviting, and if you don’t already, consider adding it to your lineup. You may have also seen other health benefits of oregano too, like its antibacterial and antioxidant properties, and it is also nutrient dense. Seriously, it is a good one to have in your arsenal! You can read more about why here, including details on the above mentioned benefits. It really couldn’t be much easier. Just place the sweet potatoes and chicken on your baking sheet and let them roast in the oven! 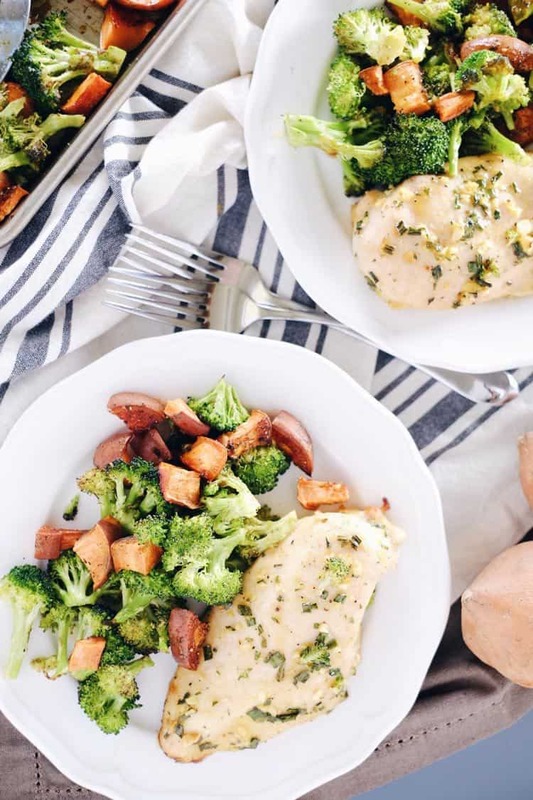 Add in the broccoli at the end and your chicken will cook just right, the sweet potatoes will come out perfectly tender, and the broccoli retains a tiny bit of crunch. 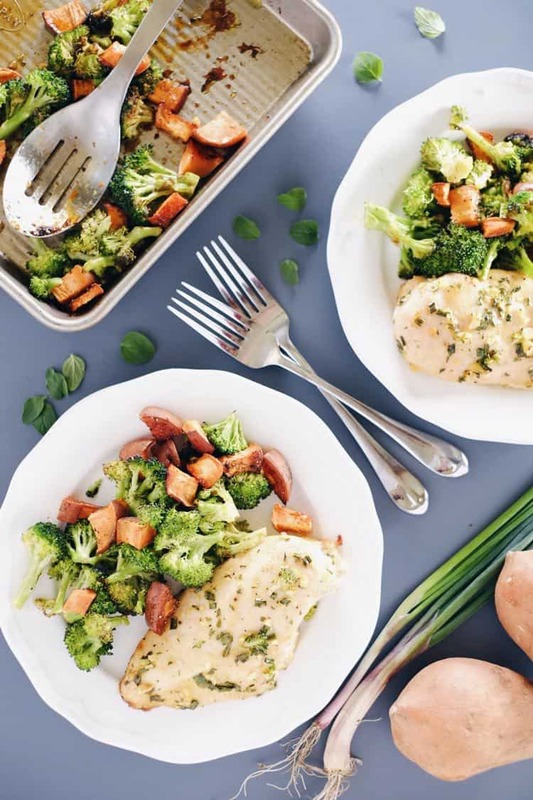 Give this one pan honey garlic chicken a try, and let us know how it goes by leaving a comment below. Also, take a photo and tag us on Instagram @realsimplegood so we can check it out! Preheat oven to 400 degrees fahrenheit. Lightly oil a large baking pan or line with aluminum foil. Chop up sweet potato into small cubes and spread out on baking pan. Drizzle with 1 tbsp oil and season with salt and pepper. In a small bowl, whisk together butter, honey, mustard, garlic, oregano and chives. Season with salt and pepper, to taste. Set aside. Move the sweet potato cubes around on your baking pan to make room for the chicken pieces. Place chicken in a single layer on baking sheet, and brush each chicken piece with honey mixture. Flip chicken over and brush the other side with honey mixture. Place into oven and roast until the chicken is completely cooked through, reaching an internal temperature of 165 degrees fahrenheit, about 25-30 minutes depending on the size of chicken pieces. While the chicken is cooking, prepare broccoli by cutting into small florets and placing in a bowl. Drizzle with 1 tbsp oil and season with salt and pepper or any other desired seasoning blend. 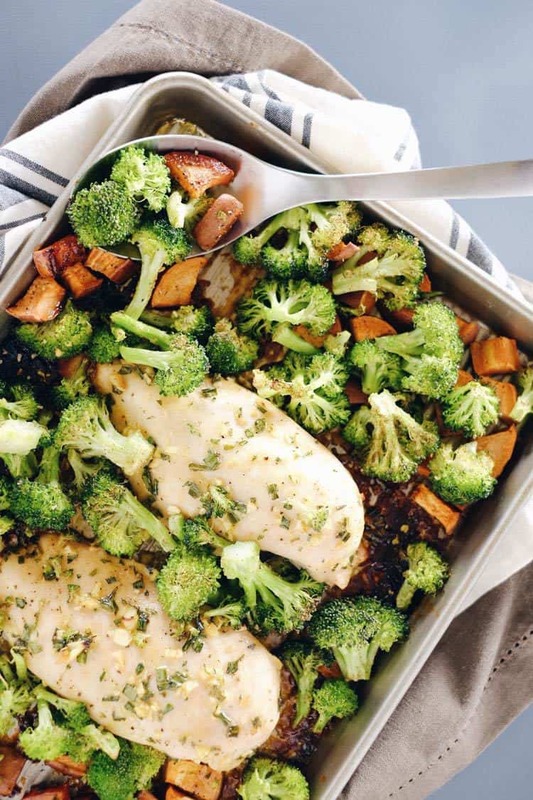 When the chicken has 10 minutes left to go, take the pan out of the oven and add in the broccoli directly on top of the chicken and potato. Return to oven to cook for the final 10 minutes. This looks so, SO good! I might have to try it with roasted leeks..
Yum! Love that idea! Roasted leeks are so delicious! Let us know how it goes! I love easy meals that have minimal clean up and this looks awesome! I have almost everything for it so I’ll be adding it to our meal prep next week! Yum! Is it possible to use frozen broccoli? Good question. We haven’t tried to make it with frozen broccoli. I would say thaw the broccoli first and drain any excess water, then go for it. I think if you just used frozen broccoli, it would get watery. If you try, let us know how it goes since we haven’t used frozen before. Thanks for stopping by! Trying this tonight! Just wanted to mention that butter is dairy so this is not technically dairy-free. I will be substituting avocado oil. I made this last night and it was delicious!!!!! so easy! What is the nutritional information for this meal? We recently upgraded our recipe plugin to be able to calculate the nutritional information for our recipes. We are slowly adding the nutritional information to our older recipes and you should see it at the bottom of the recipe now. This is an amazing recipe!!! I will add carrots and onions next time I cook this!!! Fair question! No, we don’t think the mustard taste is overwhelming. You taste the honey more than anything. Hope that helps! Let us know if you give it a try! Regarding your question about the mustard, I cut the mustard down a bit (like 1 tsp) and the mustard just complemented the honey nicely. It gives the chicken a great taste, I don’t think you will notice the mustard. Great recipe! Can this be made ahead of time , refrigerated and reheated? Sure, we’ve had leftovers of this dish and they were fine.